I took the train from Baltimore to Philadelphia today to being my New Years adventure with my friend Myron. 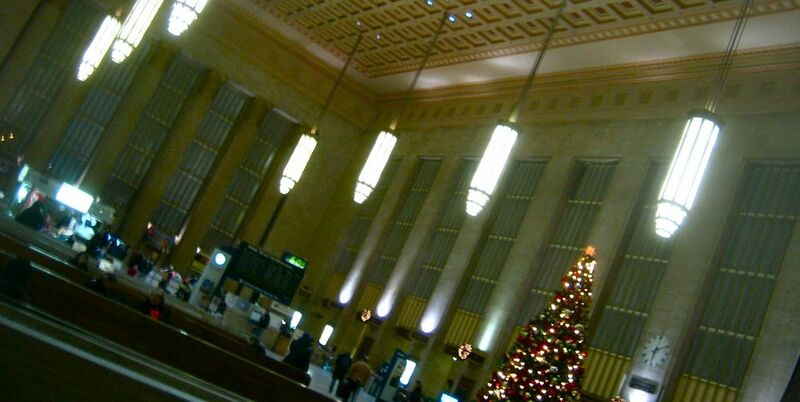 I was really impressed with how beautiful Baltimore's Penn Station is, but was blown away by the beauty and majesty of Philadelphia's 30th Street Station. Both have clearly been restored to their grandeur of earlier days, but the towering space and details of Philly's really were impressive. I'm glad that part of the trip forced me to see it, because I'm sure it otherwise would be something I would have completely missed. Perfect chapter bookends for different stages of the trip. I drove up to Baltimore today to visit my sister (and niece and nephew) for a couple days. Driving out of Winchester, I caught a shot of what used to be my Dad's office when I was a kid, and the city's Library building. 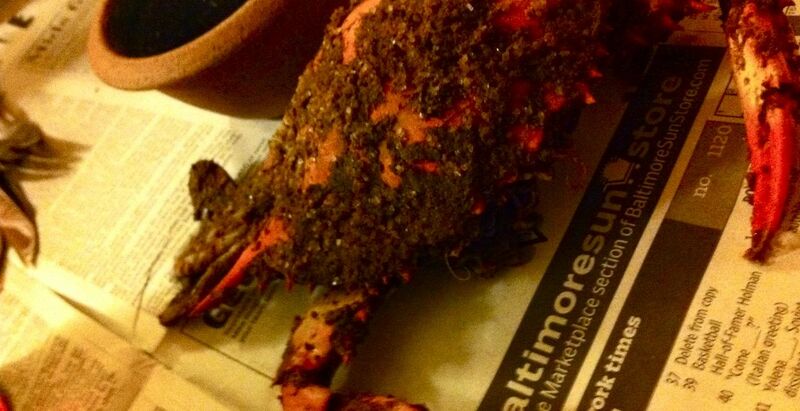 Once in Baltimore, my sister took me to get crabs at a neighborhood crab market. I love crabs (and most shellfish for that matter) and you just can't get em like this on the West Coast (though I've never figured out why.) nom nom nom. Not a lot to share other than working on some projects and Christmas shopping (eek), so just a few random slivers of the hometown to share where I am... the countryside outside of town, the street I grew up on, and the deserted downtown pedestrian mall. Monday night after our evening at the mineral baths and bowling, Curt was headin to bed while I stayed up to work. I yelled up about a tweet I happened to see about the Solstice complete lunar eclipse happening in about an hour and before I knew it, down comes Curt all bundled up and excited like a kid on Christmas morning. Apparently he's a fan of things like that (who knew?! ), so despite the late hour, he was already off in the woods finding firewood to make a bonfire in the fire pit behind our cabin. Next thing I knew, I looked out the back and he had a giant bonfire goin. I popped out a few times to make sure he was fine, and by the time I had a few animations ready to set off and go join him, the eclipse was underway. It was a brilliant night for it. Clouds were blowing through and framing the view more than obscuring it, with crystal clear skies in between. As the moon became more of a wedge, we started noticing more and more shooting stars as well, not to mention how full the sky was of other stars. The crisp clear view of the eclipse was really one of the best I've ever seen, but add in the meteors and the bonfire, and it really doesn't get much better. I made attempts to catch photos of it, but with my crappy little digital cam magnified on a 10x zoom and me shaking in low light, they weren't much to show. Trust me, what we saw with our eyes was so much more clear and amazing, but if you missed it, at least this is somethin. For me it was a spontaneous night that I won't soon forget. Finally a few hours break today... had a couple conference calls, but once those were done, we ventured to check out the mineral baths in Berkeley Springs State Park, used as a resort since the 1750's. The mineral waters are naturally at 74 degrees, fed from nearby springs. We took a half hour dip in the warm baths. Kinda interesting experience is the best way we'd both put it, we decided; who knows if any mysterious healing powers will come from it. We walked around a little after and grabbed some dinner, then decided to hit the Bowlerama. Neither of us claim to be any good, but we did manage to make big improvements each game. On top of that we both were only 1 or 2 points apart in every game. Pretty fun day. Maybe I'm gettin some decompress in after all.